Kieran O’Hare is a respected and highly-sought after performer on the uilleann pipes, concert flute, and tin whistle. He was born into a musical Irish-American family, and he began to play at home while in his early teens. Kieran moved to Dublin, Ireland, in 1991, where he received a degree in Modern History from Trinity College, Dublin, and now resides in Chicago with his wife, the fiddler Liz Knowles. 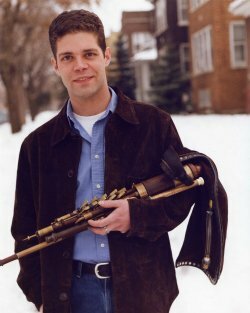 In 1994, Kieran received the honor of being the first American-born player of Irish music invited to perform in the annual “Ace and Deuce of Piping” concert, held in Ireland’s National Concert Hall. Since then, he has made countless appearances at festivals and concerts in North America, Japan, and Europe. Among the many artists with whom Kieran has performed, toured or recorded are Mick Moloney and The Greenfields of America; Chicago fiddler Liz Carroll; Cape Breton fiddlers Jerry Holland and JP Cormier; Canadian singers Dave Gunning and Gordie Sampson; Irish vocalists Danny Doyle and Niamh Parsons; Celtic and early music performers Ensemble Galilei; the Trinity Irish Dance Company; the Milwaukee Symphony Orchestra; the Cincinnati Pops Orchestra; Bonnie Raitt; The Paul Winter Consort; Josh Groban and Don Henley. Kieran also has worked extensively in designing music for the stage, and was the featured piper for Seamus Egan’s score for the Irish dance show “Dancing on Dangerous Ground” which premiered in 2000 in London’s West End. In 2002, Kieran appeared in a musical role in the Sam Mendes film Road to Perdition. Kieran has a reputation as an outstanding teacher of Irish music, beginning with the years he spent as a teacher of the pipes in Na Piobairi Uilleann, The Pipers’ Club. Since then, Kieran’s reputation as a teacher of Irish music has grown, and has included stints at the Willie Clancy Summer School, The Swannanoa Gathering, the Catskills Irish Arts Week, The Augusta Heritage Festival, and at various pipers’ tionols and musical gatherings around the country.